Why Schweiss - Advantages | Airplane Hangar Doors | Wind, Rain or Snow Schweiss is the Automatic Choice No Matter What Weather. When you think doors, think "Functionality." That simple word says a lot because if your product has functionality, it for certain is consumer friendly. So let's start with a door that provides both shade and awning when open, yet readily drains summer rains and winter snow. That's CREATIVE ENGINEERING! That's Functionality. That's Schweiss Doors. With Schweiss, it's all there. "As a pilot with my own hangar, I wanted a SPECIAL LOOK for my hangar door that made me PROUD of both my AIRPLANE and my HANGAR. The Schweiss team delivered in spades. They gave me color choices to compliment the rest of the hangar. I got a walk-through insulated door with a "Custom Designed" window. Plus four additional "double pane" windows for great interior lighting. Since I heat my hangar, my Schweiss door has an R30 insulation value." "I had heard and read much about Schweiss Doors. It was exciting to hear Schweiss was now also offering a new design Hydraulic Door, again with absolute security. Schweiss calls it "auto lock" and believe me, that door is squeezed totally tight." "And thanks to their super convenient remote control unit, my hangar door is already open as I taxi up to my hangar. You tell ME what could be a better package!" WHOMEVER I TALKED TO PRETTY MUCH SIMPLY SAID, "GO SCHWESS!" "My airport operation has 24 hangars, each hangar is equipped with a Schweiss Door. Why Schweiss? Because I checked lots of airports, lots of hangars, and lots of door systems." "Pilots, airport operators, EVEN CONTRACTORS, whomever I talked to pretty much simply said, 'Go Schweiss.' They Give You More!" "Trust me. That's what buying 24 doors is all about. Full value, plus great service." 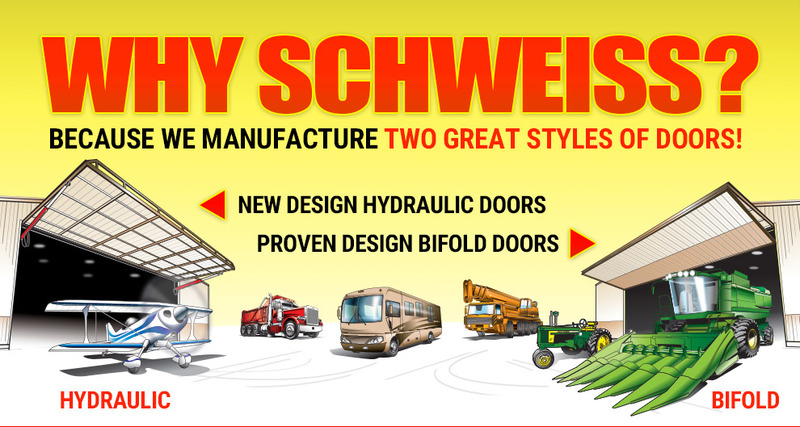 SCHWEISS DOOR PACKAGE IS THE "PEOPLE'S CHOICE"
Hydraulic & Bifold doors have been around for years. Schweiss with 34 years building doors just simply MAKES THEM BETTER. They've added NEW LIFE to the door industry. Schweiss doors can be the architectural highlight of an entire building. And with their manufacturing experience, I do understand why the Schweiss package is the "PEOPLES CHOICE." "Very important to me is that Schweiss Doors are tremendously functional, REGARDLESS of the weather. They do indeed beat anything on the market. When 'door shopping' my suggestion is to pay attention to the structural engineering of the entire door unit. That means check the heft of the tubular steel framing members, the welding, the electrical package, and of course the closing mechanism itself. Their patented Lift Strap opening & closing mechanism is a gem. It's quiet, clean, quick, durable and is tremendously safe." "Sure I'm biased because I bought Schweiss. But I first did several comparisons of other brands and found out there are lots of 'wannabes' out there that just don't deliver the overall quality of a Schweiss door. Yes, some offer 'great looks' but rugged, dependable doors with strong warrantees are the bottom line." "If you're talking value, dependable performance, operational safety, overall functionality, and artistic looks, the Schweiss package delivers." "Yes, Schweiss now offers Two great doors. I chose the Schweiss hydraulic basically because 'weather conditions' are an issue where I live." MY CHOICE STARTS WITH HEAVY-DUTY ENGINEERING! "When I built my hangar, I wanted a door that looks good, operates efficiently for many years, and provides a turnkey install job. The Schweiss crew delivered my door and installed it all in one day. And it's guaranteed. That's service. That's quality, That's experience. That's engineering I can count on. That's Schweiss. And that's MY CHOICE!" "I take my hat off to the Schweiss team. Yes, Schweiss Doors have been around for a few years (34 I'm told) and that's what makes them special. The Schweiss team didn't rest on their laurels. They keep listening to US CUSTOMERS....for even better ideas. Like my request for a very special closure system. I didn't want just another "Cookie Cutter" door. I wanted a CUSTOM DOOR, just for me." "No problem for the Schweiss team. They tell me every Schweiss door is Custom Built, to the exact specs of the buyer. You don't get that manufacturing flexibility from any other builder." "Plus the're time-tested Lift Strap opening and closing system creates a new level of dependability, safety, and quiet operation for their bifold door customers. And how about their new Hydraulic doors? Talk about a clean, rugged design. Equipped with a powerful hydraulic "Red Power" unit that drives two heavy-duty hydraulic cylinders, you've got super dependability. "That's the added bonus of dealing with a manufacturer with experience, 34 years for the Schweiss team. NOBODY, absolutely NOBODY, has that much manufacturing history, experience and knowledge. "Buy Schweiss. Get Value. It's really that simple!"